Apology: Sorry, this took so long. Lots and lots of ideas, but I had a hard time getting an angle on how I wanted to write this chapter. Thanks a million to all who have been giving such wonderful reviews to the earlier chapters of Hellboy's Family. Author’s notes and Disclaimer: I finally got to the chapter on Liz in Hellboy’s Family. Of course, the main characters aren’t mine. I wish they were; I’d be a lot richer. If you don’t recognize a character from either the movie or the original comics, they belong to me. Reminder: My Hellboy fanfics are mainly based on the movie, even though I borrow some of my ideas from the original comics. The character of Elizabeth ‘Liz’ Sherman as portrayed in Guillermo del Toro’s film has several points of departure from the character as presented in Mike Mignola’s Hellboy comics. 1. Liz Sherman is older in the original comics; having been born in 1962 in Kansas City, she is eleven in 1973 when she inadvertently pyrokinetically causes the fire that destroys an entire city block, including her own family. In the movie, she was born in 1975 and is living in Detroit where a similar conflagration occurs when she is eleven years old in 1986. 2. In the comics, she is a chain-smoker and has red hair. In the movie, she is a non-smoker with shoulder-length raven-black hair. 3. Mike Mignola portrays her relationship with Hellboy in the comics as a close friend and fellow Bureau colleague, not as a potential romantic interest. Mignola doesn’t deal with romance in his Hellboy comics, but various hints lead to Liz possibly being romantically aligned with Abe. Other hints in Mignola’s original comics suggest pairing Hellboy with Bureau folklore consultant Kate Corrigan, whose character does not appear in the movie. As far as I can tell from the movie backstories, Guillermo del Toro has Hellboy and Liz first meet when she comes to the Bureau in her late teens. In the original Hellboy comics, you first see Hellboy and Liz together as adult colleagues. However, in the first issue of the B.P.R.D. spin-off comics their first meeting when she was eleven is detailed in a flashback. I adapt that idea in what I write in this chapter and also establish Kate Corrigan as an old friend and former lover. Slumping on a stone bench, thankfully strong enough to support him, Hellboy gazed pensively across a lake at the newly restored façade of Newark’s Cathedral Basilica of the Sacred Heart. The view was only partially obscured by the bare branches of trees, some of which would be covered in a blaze of cherry blossoms by the spring. Having been a relatively warm winter so far, there was little in the way of snow. It was just after seven in the morning; sunrise was still some minutes away. As the southern corner of the park where he was seated was somewhat isolated and the park only recently opened for the day, Hellboy hoped he would be left undisturbed by others. Now a fully recognized citizen of what had become the United States of North America and long the chief director of the Bureau his adoptive father had founded in his infancy, Hellboy had ostensibly returned to Newark to inspect the still existing facilities located there. The true reason was that he was homesick; especially now that fish-man Abraham Sapien, the very last of the ‘family’ from Hellboy’s earliest decades, had moved on after almost two centuries of partnership. Abe had recently retired from the Bureau, requesting transport to an uncharted island south of the Bahamas and desiring to be left alone there. That was the last time Hellboy had seen or heard from his long-time friend and partner. He wasn’t sure if Abe was alive or dead, or even completely transformed in some further metamorphosis; he just knew he was gone and would never return. “My God, you’re Hellboy!” Turning away from his contemplation of the cathedral, he found he was looking up at a tall, brown-haired, brown-eyed boy, possibly in his late teens. He was dressed in jeans and a black denim jacket. Hellboy was annoyed by this unexpected interruption; but he was still somewhat amused that contemporary kids’ dress had once again managed to turn back the clock to the century he had been born in. “Nah, no bother, kid,” Hellboy strangely found he wanted to talk to the boy, to admit exactly what was troubling him. Yet, no words would come and he remained silent as the boy walked away. After a few minutes, Hellboy wearily closed his eyes. He had already felt lonely before this encounter, now he felt even worse. Opening his eyes again, he looked around him. He then got up from his bench and walked further along the lakeside to where the boy was dejectedly tossing little pebbles, disturbing the water’s smooth surface. The boy studiously ignored the seven-foot tall, red-skinned demon that towered over him by almost a foot. With a sudden smile, Hellboy bent and retrieved a small, flat stone; he sent it skipping over the surface of the lake with an expert flick of his left hand. The stone made four good hops and several little dribbles before sinking into the middle of the narrow lake. The boy looked up at Hellboy, returning his smile, and then picked up a similar flat stone; with a flick of his right hand, he attempted Hellboy’s feat. After one feeble hop, the stone sank into the water. “Yeah, I guess it is my birthday,” Hellboy said after a brief silence, his smile fading, “I haven’t celebrated that in a hundred years; not since Liz died,” he added in a whisper. Hefting another larger rock in his gigantic stone-like right hand, Hellboy slammed it into the placid lake with enough force to cause a huge geyser of water to spring on high before crashing back down to the surface. Hoping the water that splashed into his face would hide from the boy any tears that insisted on forming, he shook the water from his tan coat. “That’s okay, kid,” Hellboy looked a little more closely at the youth standing next to him, trying to recall where he might have met him before. He had seldom been to Newark since the main Bureau headquarters had relocated fifty years previous to its new facilities in Washington, D.C.; and yet the boy’s face, especially his brown-with-a-fleck-of-green eyes, reminded him of someone. Hellboy was struck speechless at this revelation. He watched as Trevor dug into one of his jeans pockets and brought out an e-wallet, speaking into a voice-activated organizer. Peering into the screen, Hellboy saw a copy of a photograph he had avoided looking at for decades. Photographs, like this one, had become too painful a reminder of mortality—not of his own, but that of the people around him. He looked into the happy faces in this old photograph: himself, Trevor Broom, Abe Sapien, Kate Corrigan, Walter Carlton and his daughter Mindy—and again felt the bereavement of being the only one left out of this group. Blinking in surprise, Hellboy looked up from the photograph he had still been contemplating. Hellboy again looked at the photograph. 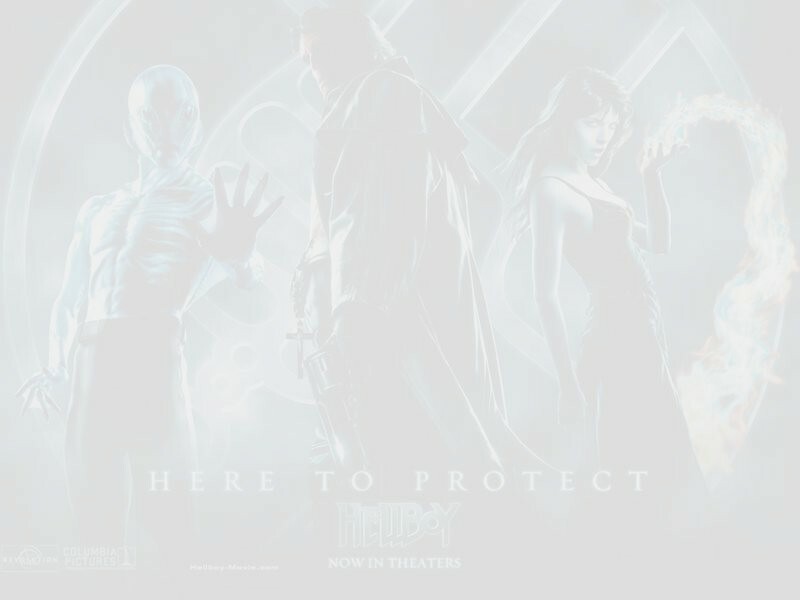 Walter Carlton stood next to Hellboy; one arm around Hellboy’s shoulders, the other holding his daughter, Mindy, close to him. Trevor filed the electronic card in his e-wallet and nodded, not trusting himself to say any more to persuade Hellboy to come with him. ‘He looks different when he smiles,’ he thought to himself as he walked away; having no idea that this was very similar to what Walter Carlton, his great grandfather, many times removed, thought of Hellboy the first time he met the big red guy. Author’s afterword: Yes, this chapter is really going to be about the developing of Hellboy’s relationship with Liz and about the further course of his relationships with Trevor Broom and Abe. But, for some strange reason, Liz keeps coming at me from the vantage point of how her story with Hellboy ends (before I even get around to writing the beginning of it). What comes later in this chapter will be intimately connected to my Hellboy fics Family Portrait and The New Girl. It might be a good idea to read (or re-read) these while you’re waiting for Part Two of this. Also, if you haven’t read the earlier chapters in Hellboy’s Family, you will encounter mention of events or characters deriving from these earlier chapters. Walter and Mindy Carlton derive from Chapter Five. Branch Brook Park is a real park in Newark. It is the first park to be designated in the US as a county park. The Cathedral Basilica of the Sacred Heart can, indeed, be seen from this park. It was my own idea, in some of my earlier Hellboy fics, to place Trevor Broom’s funeral in that beautiful church.